Everyone with a history on the Internet must have heard about SEO techniques (search engine optimization) that will boost their number of visitors and increase traffic and visibility of their websites. However, there are plenty of other tips which can lead to the same results, but with a little more time. Google Analytics is a program developed by the California-based multibillion company, struggling to offer the best statistic tool on the Internet. 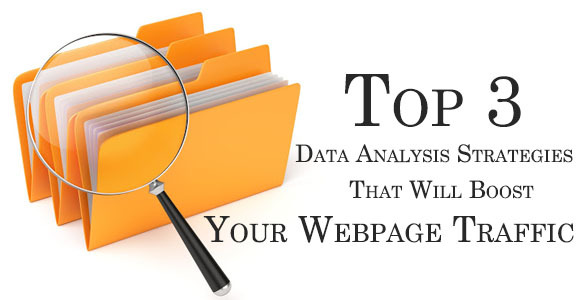 And although other web analytics tools involve similar tools such as Site Catalyst or Web Trends, Google’s own tool has the biggest popularity among top rated pages and personal bloggers. However, joining the Google Analytics “community” might become hard, as there are plenty of tools to browse through and complicated menus ready to satisfy all your requirements. Thus, in this article you will find the most used data analysis strategies provided by Google Analytics which will work out for you and your online business/ blog. The easiest tool provided by Google Analytics is, without a doubt, this overview report. Through such reports you will be able to find out the exact percentage of traffic you received by segments like Search Traffic, Direct Traffic, or Campaigns. It is important for your business to know which types of traffic best suit your website, to know on which ones to focus next. For instance, you achieve more search traffic by advertising better your website/ blog, and make it more visible to the international community. On the other hand, the Campaigns menu will give you a hint of the number of the campaigns are currently available to promote your website, and where you can find them (for instance, via social networks or e-mails). And because searching always comes difficult to most users, you can use the following: Traffic Source – Sources – Search – Overview to have a clear and macro vision upon the search options your webpage or website is currently displaying. Learn everything you need to know about the alchemy of generating online high revenues from the best. This Google Analytics tool will help you better understand how landing pages work and how they can be improved in order to generate bigger cash flows. Moreover, by listing your top advertising websites, you will see how many visits each site gathers a day, how much time a user spends on average on that page, and how much money does the page worth. This is useful for you to know which pages will most likely bring you revenues, and which ones you should probably quit on. One of the best features provided by Google Analytics, and that no other Google Analytics alternative programs will offer you, is the specialized section for your mobile devices. Most important websites focus these days on how they can improve this mobile sector, as more and more people become addicted to high –tech gadgets,including smart phones or tablets. Such reports are available in the area: Audience – Mobile – Devices. Learning more about your mobile devices will probably determine you to have a different approach regarding your business. The first step you need to make is to determine the top mobile consumption platforms (including specialized types of phones and tablets: iPads, iPhones, Samsung Galaxy SIII smart phones, etc.). Understand better mobile performance compared to original website performance, and learn if you have any handy methods to improve the one running slower. Especially if your website is at the beginning, and it still requires numerous online visitors to grow traffic, you will need to work on your mobile marketing “skills”. This includes making your mobile page more attractive to people, by displaying an easy-to-see content, and encourage people’s comments. To sum up, using Google Analytics will not only improve your overall understanding regarding your personal webpage or blog, but will also help you monitorize your blog’s activity online. Author Bio : Prateek is an SEO Consultant and a Part Time Blogger with years of experience using Google Products like Analytics and Webmaster Tools. This experience has inspired him to write this resourceful article.